Four student films from Far Eastern University will vie for the Best Short Film at FACINE 25: The 25th Annual Filipino International Cine Festival, considered the largest and longest-running festival of its kind in North America. 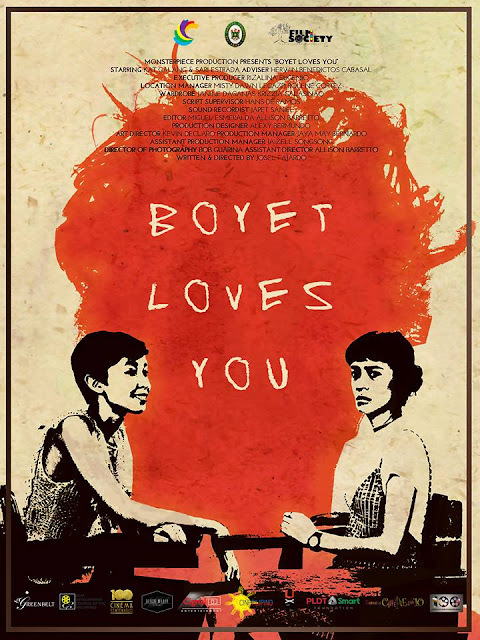 Boyet Loves You and Caterwaul, both directed by Josel Fajardo, Pua Iyam by Juan Pablo Pineda III and Touch Move by Frances Louise Giner made it as finalists in the event organized by the Filipino Arts and Cinema International in San Francisco, California. Fajardo, Pineda and Giner are all alumni of the FEU Film Society. The silver anniversary of the film festival will open with the short film competition on October 18 at the San Francisco Main Library and the SF Philippine Consulate while the main competition will be held from October 19 to 21 at the historic Roxie Theater. In Boyet Loves You, which is also a short film finalist in the CineFilipino Film Festival 2018 Open category, Gab (Sari Estrada) wants to introduce her best friend Mari (Kat Galang) to Boyet. The problem is, only she can see Boyet. The comedy-horror flick bagged the Best Film, Best Direction, Best Editing, Best Sound and Best Performance awards at Sinepiyu 2017's Golden Reel category. Caterwaul is a film where painful secrets are revealed at two girls' sleepover. 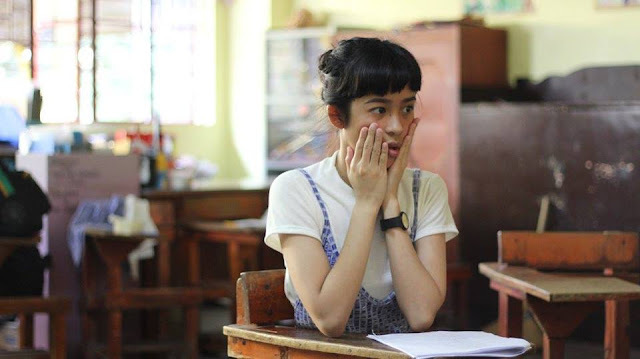 While watching an R-rated movie, a girl (Andrei Eunice Osano) shares her first sexual experience and re-enacts it to a friend (Quennie Abuyuan), who does not know that she's in for a dark revelation. The seven-minute drama won the Gold Prize in the Viddsee Juree Philippines Awards. In Pua Iyam (Coming Out), a young Filipino-Chinese student (Rowi Du) comes out to his childhood friend (Raphael Cruz). 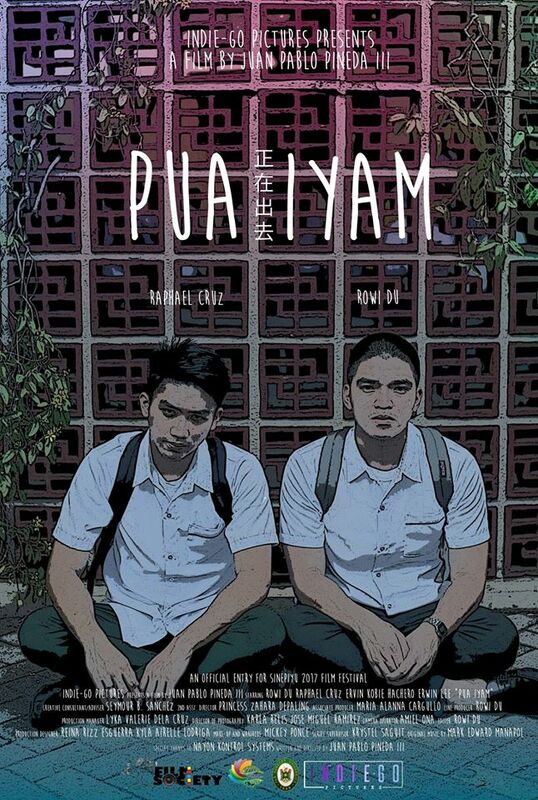 The short film brought home Best Screenplay and Best Actor in a Lead Role at the 9th Largabista Film Festival in Tacloban City, Leyte; a special citation on gender sensitivity from the first Palawan International Film Festival; Best Film, Best Director, Best Performance and Best Poster at Sinepiyu 2017's Black Reel category; Gold Award for Best Picture, Outstanding Direction, Design Excellence and Technical Excellence awards at CineSB 7: The Main Installment's Sibol category; Best Cinematography and another special citation from Piling Obrang Vidyo XIV; and Cardinal Bronze Film Award, Best Film Editing and Best Cinematography at CineMapúa 2018's intercollegiate category. With characters as chess pieces, Touch Move depicts the difficulty of moving on. The film won Best Screenplay, Best Production Design, Best Sound and Second Prize at Sinepiyu 2017's Black Reel Category. It also garnered different awards from the Ateneo Video Open, Pelikultura: The CALABARZON Film Festival and 9th Largabista Film Festival. The short film finalists, which were selected out of 125 submissions to the competition, have a wide range of format, genre, style and subject, all 45 minutes and less in length, both student and professional works, including works by non-Filipino filmmakers with Filipinos as subject. The best short film will be awarded a $100 cash prize and Certificate of Recognition. Special citations will also be awarded in any category upon the discretion of the Jury. Meanwhile, FACINE relaunches its main competition section with nine full-length films vying for awards in different categories. The finalists are 2 Cool 2 Be 4gotten written by Jason Paul Laxamana and directed by Petersen Vargas, Bomba (The Bomb) by Ralston Jover, Kita Kita (I See You) by Sigrid Andrea Bernardo, Meet Me in St. Gallen by Irene Emma Villamor, Melodrama/Random/Melbourne by Matthew Victor Pastor, Ang Pamilyang Hindi Lumuluha (The Family That Never Weeps) by Mes de Guzman, Pauwi Na (Pedicab) by Paolo Villaluna, Tale of the Lost Boys by Joselito Altarejos, and Tu Pug Imatuy (Right to Kill) written by Arnel Mardoquio and directed by Arbi Barbarona. FACINE is a nonprofit media arts organization that aims to promote and develop Filipino cinema as a social document of cultural heritage, and as medium of artistic expression. Dedicated to empowering artists and audiences on films that speak about Filipino communities globally, FACINE has organized the festival for the past 25 years and it also hosts film-related events in the SF Bay Area.